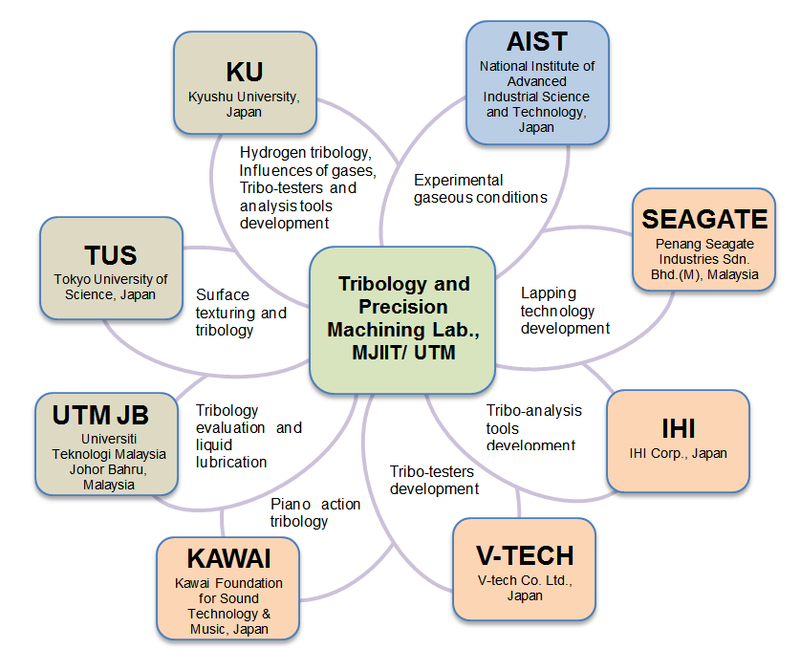 Tribology and Precision Machining i-Kohza (TriPreM) is established to research fundamentals of tribological phenomena and support related industries through the research activities and cultivating students and i-Kohza members. Our philosophy and interest is to develop solutions for practical problems from scientific view point. With this philosophy, TriPreM has 4 years’ experience of industrial collaborative research projects with SEAGATE, IHI, KAWAI and other industrial companies. We have designed and developed original testing apparatuses accordingly the requirements to find the root causes of practical problems. Diagram of Tribology and Precision Machining Lab. Collaboration works: The Tribology and Precision Machining Research Lab is collaborating with various universities, industries and AIST.